When in Manila, one of my favorite ways to wind down a busy weeks is over a bottle of wine with some good company. After almost two months of living in Boracay, and slowly realizing the significant lack of wine in my life, I discovered the perfect wine bar where I could escape from the busy beach nightlife and quietly enjoy a good glass of wine. The giant cork caught my eye! I first noticed Cork Boracay while riding down the main road on a tricycle. The giant cork sign grabbed my eye and I made a mental note to visit at some point. A few weeks later I decided to attend their charity wine tasting event for the Philippine Red Cross and in an instant, Cork became one of my new favorite hang outs in Boracay. 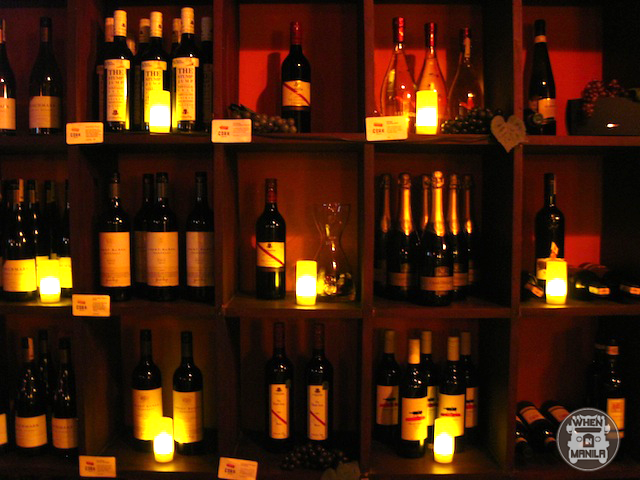 Stepping into Cork, I was immediately taken by the intimate and comfortable ambiance created by the wine-lined, tangerine colored walls, dim lighting and soft music. There were only a handful of people at the bar and it seemed that everyone was familiar with each other, as is expected at places that are frequented by the residents of Boracay. And for me, its always a good sign if the locals are hanging out at an establishment because it’s been tried and tested by those who know best. I settled down at a table with some friends and the wine started free flowing and so did the conversations. 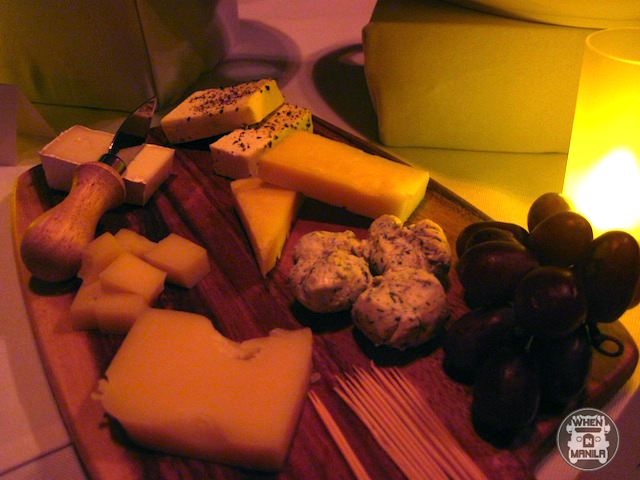 For the tasting, we were served red and white Benchmark Grant Burge wines and a selection of gourmet cheese and tapas to pair with our wine. 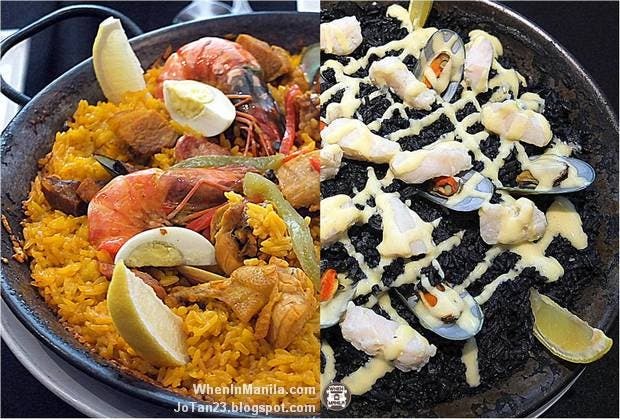 The menu at Cork Boracay serves a selection of quality wines that were hand picked by the creators, Toney Ellis and Rommel Temporal, who share a passion for wine. 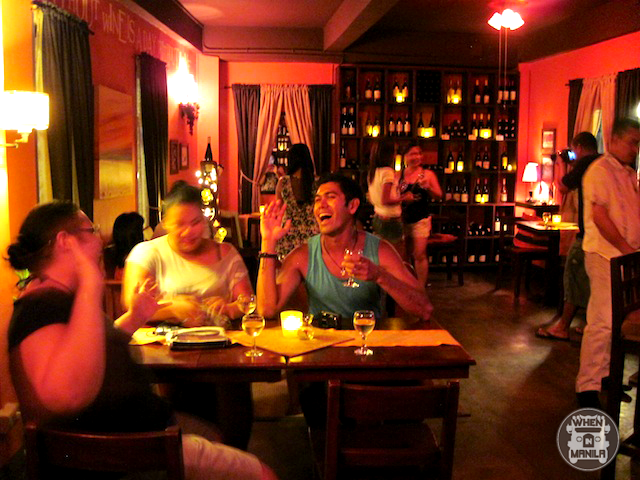 So rest assured that you won’t be finding any vinegar tasting wine at Cork Boracay. I enjoyed looking at all the different kinds of wines on display on their shelves and came across several labels that I’ve never heard of before but would certainly like to try some day. I wouldn’t say I’m anywhere near being a wine expert and pretty much all I know about wine is that I enjoy it in red and white. Thankfully for me, my level of wine sophistication (or rather, lack of) was of little importance when drinking in a place like Cork Boracay. It’s a very laid back kind of wine bar where anyone with a curiosity for wine can just walk in and order a glass or a bottle. The wait staff are extremely friendly and can help you to pick a wine from the menu even if you’re not sure what you want to order. They have made it a point to avoid any kind of wine snobbery because they simply want all their guests to come in and enjoy themselves. That is a huge relief for someone like myself who likes to drink wine but sometimes can’t even pronounce the name of the wine! 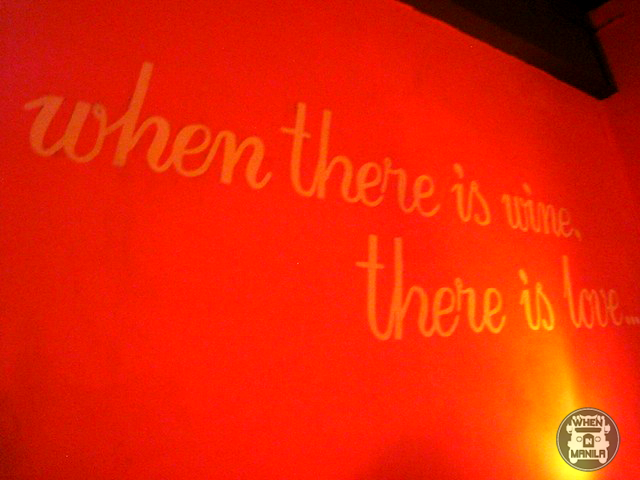 The writing is one the wall: When there is Wine, there is love. And that is definitely true of my experience at Cork Boracay where I soaked up the soothing ambiance over a couple glasses of some really great wine while enjoying the company of good friends and making some new ones along the way. Writer by profession, artist by passion, and mermaid by midnight. Having been raised between time zones, most of my childhood years were spent in airports and swimming pools. I currently live on an island, in fact, an archipelago of over seven thousand islands, where I continue to explore the waters and terrains of my birth. Dive in to my world at www.idanoelle.com. Surviving Sabah Series III: A Taste of being Headhunters at Mari Mari Village! This Mobile Service Will Groom Your Dogs Right at Your Doorstep!